We eat a lot of noodles in our house. Most of the time they’re in the form of pasta, given our strong Italophile bent, but we’re also interested in what other nations do with the endlessly versatile flour paste. (Not the French, however: In our experience the French always overcook their nouilles.) 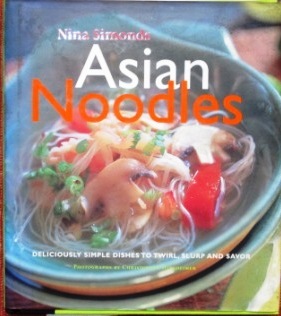 Accordingly, I was happy, some years ago, to discover the book Asian Noodles by Nina Simonds. Its recipes range widely – China, Japan, Vietnam, Thailand – and Simonds also presents her own adaptations and improvisations, all with an eye to accessibility for the western cook. For instance, she freely accepts substituting fresh egg noodles or dried Italian pasta for any of the Asian rice or wheat noodle types specified in the recipes. That can certainly be handy, if you don’t keep an Asian-inflected pantry, and I’ve found the results always tasty, though often at the expense of the genuinely ethnic flavors. The scallop dish I made this week turned out that way. The recipe is basically Japanese, but the way the ingredients are handled made it come out seeming to me more like a California creation. It starts by having you make a cooked marinade of soy sauce, water, wine, sugar, minced fresh ginger, crushed red pepper, and cornstarch – fairly typical components of a teriyaki sauce. When the marinade has thickened from the cornstarch and cooled, you mix half of it with your sea scallops and let them sit for an hour. Meanwhile, you’re thinly slicing a red bell pepper, parboiling broccoli florets and their thin-sliced stems, and cooking thin wheat noodles – “such as angel hair,” the recipe says, so I used Italian cappellini – until just tender. Here are all the components, waiting to be combined. Then you thread the scallops on wooden skewers (previously soaked in water to keep them from burning up during the cooking) and broil the scallops very briefly, brushing with the remnant of their marinade. That’s all the cooking the scallops get, so now, unless you’re not the only cook at work in the kitchen, they have to be set aside to keep warm while you finish the dish. 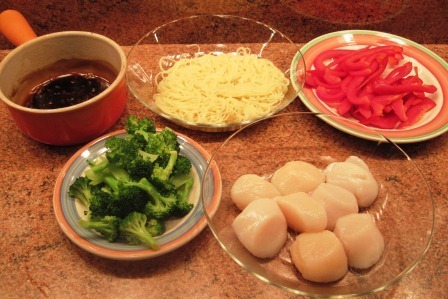 I found this timing a bit off-putting, because soggy scallops are not a joy. 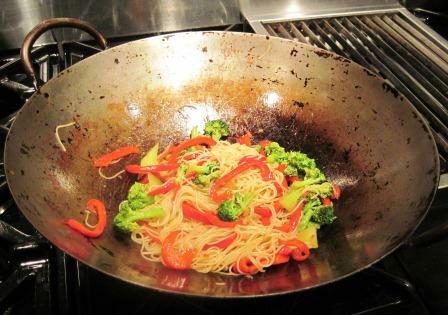 The finishing is a simple stir-fry: sauté the peppers in oil, then the broccoli; add the other half of the marinade and then the cooked noodles. Here they all are in my beloved old wok. This big, ugly, un-stainless steel workhorse has been with me for about 40 years, and it’s a wonder. Even though I use it maybe only four or five times a year, it always retains its seasoning and nothing ever sticks in it. 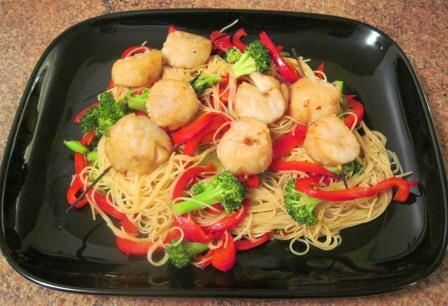 As soon as the stir-fry mixture was ready, I transferred it to a platter, poised the skewered scallops on top, and served it. As it was, we thought the dish would’ve been OK for a lunch, but as the main course of dinner it was slightly cloying. Nevertheless, sugar addiction being the American national disease, I’m sure many people would love it, just as it is. And in defense of Asian Noodles, I will say that I’ve had happier results with some of its other recipes.